Being a hard-core computer geek, I had always felt the need to have a generic PC to run Linux or FreeBSD in addition to my now somewhat aging Apple PowerBook, which I use as a desktop and writing pad (when closed due to desk-space constrains...). Given the space, noise and aesthetic constraints of living in a NYC studio apartment - suburbanites, think walk-in closet - a standard desktop or server was pretty much out of the question and another laptop didn't seem ideal either. I was planing to use it as a server, which is accessed remotely and need a monitor and keyboard only when something goes wrong. AOpen makes with MP915 a knock-off design of the Mac mini - not as nice as the original, but not bad compared to other PCs. 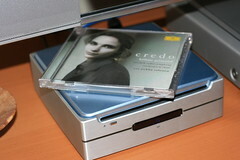 Like the Mac Mini it's a square box about the size of the CD-ROM drive. 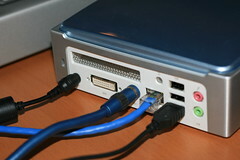 Since it uses laptop parts, the computer itself can be low-power and thus much quieter than most desktops. Since it's a bare bone system, prices start at about $300 - $400-$500 for a reasonable machine. 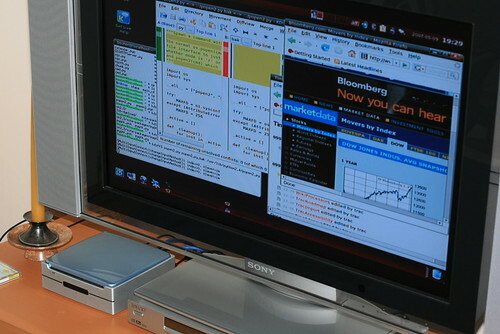 The other nice thing, is that it has an S-Video output for the monitor, so I can just connect it to the TV and switch the channel when I need to see the output. As the keyboard, I use a Logitech wireless mouse and keyboard, which is about 3 times the size of the PC, but I guess there are not many alternatives for cheap super-small server-room keyboard & mouse combination. Thanks to using plain-vanilla hardware, installing Sabayon Linux from the live CD was a breeze, bypassing the somewhat manual install-process of Gentoo Linux on which it is based and which I really wanted for its flexible source-based package management system.